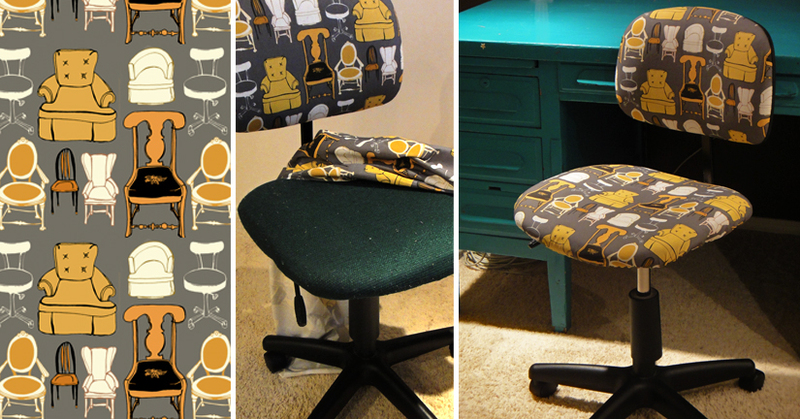 I recovered my boring old deskchair with this amazing fabric from Spoonflower. The plastic back of the backrest popped right off (with a bit of prying with a screwdriver) which made it easy to stretch the fabric around and hide my messy stitches. It was just like stretching a canvas, but with nothing to staple into, I sewed directly into the existing fabric. Just big messy stitches - who's going to see them? For the seat I just made a casing hem and put in a drawstring and pulled it snug. Voila! These little birdies (all 25 of ‘em) were made from sculpted paper. I used my paper shredder, which makes a nice cross-cut, leaving me with small bits of paper, and mixed handfuls into a flour-water glue, and stirred (with chopsticks, and then with my hands) until it was the consistency of muffin batter. Taking a scoop, I would squish, mold, and smooth it in my hands until it had a loose bird shape. I was aiming for a vague form: mostly just a bulbous body with a slight beak and hint of a tail, knowing that the painted details would help later on. They dried for a day at room temperature, then I put them on the vent to heat through slowly and dry full. After painting them, they were sealed with a quick-drying acrylic varnish. I tried tung oil, but it was taking days to dry, and didn’t give me the high gloss finish I wanted. I like that they look a bit like pottery because of the high gloss finish. A feast of colour. Yummy, yummy colour. In the same way and for the same reasons that I am not deterred by the time investment required to make croissants, I am lured to hand quilting. Working with your hands on a physical creation is one of the best ways of being present—what better way to practice my Hereness! I can probably also blame my cousin for hiring me to help sew quilts for her book. That is when the love of hand-quilting fully took root. I enjoyed (after my callous developed) many hours and weeks of patiently (and joyfully!) making teeny tiny whipstitches to piece together many of the small hexagons of her Village Quilt. Golden, flaky crescents of bliss. From scratch. Sometimes out of nowhere, I’ll decide to attempt something in the kitchen. Like the time I made a croquembouche for my parent's anniversary. It will come up in conversation or something, and I’ll say “hey, yeah, how is that made, anyway?” Something that once seemed too complex to ponder about it’s creation then becomes a new kitchen project. Croissants are one of those things. I knew—in the same vague, assumptive way that I know that cars run on gas—that it had something to do with layers. Layers of butter and dough and... air, magical, magical air. I also knew that, in my mind at least, it had that daunting, do-not-attempt-at-home feeling. But that just makes it all the more alluring. Is there anything more beautiful that those flaky, airy layers of golden pastry? Just the thought of croissants makes me happy. Now, I strive to eat healthily and get my 5-10 servings of fruits and vegetables each and every day. And most days I do just that. But on every level—physiologically, physically, psychologically and spiritually—I don’t think I could live without croissants. Let’s just not even think about it; it’s too terrible to think about.